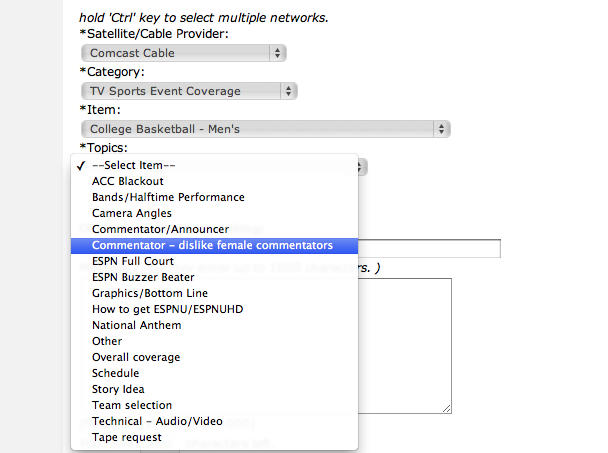 This screen shot is apparently from a complaint form on ESPN USA. One can only hope that it is a devious tactic employed by the staff at ESPN to filter out the idiots in the viewing population. The option is clicked, the IP address is stored, and a troupe of pre-menstrual ESPN presenters (female and male) go round and issue a good kicking to the fool in question. If you are unfamiliar with the brilliant Darwin Awards website, check it out here. You won’t be sorry.